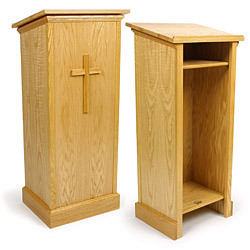 These light oak pulpits with cross feature an angled reading surface with a raised edge that prevents reading materials from falling off. 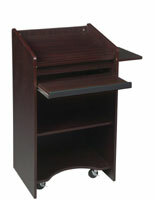 In addition, the podiums feature an open storage shelf for keeping more supplies. 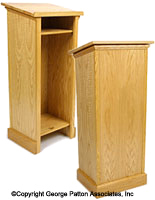 The light oak pulpits feature a long lasting design with their wood and plywood construction and water resistant coating. 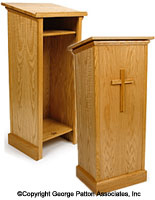 Often found in churches, the wood lecterns with an open design come with a front mounted cross that measures 7" x 12". The oak pulpits with a rasied edge measure 45" tall, making them perfect for most average-sized adults. 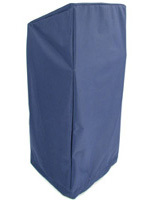 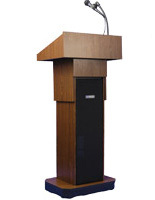 The water resistant podiums require minor assembly, by attaching the top ledge to the frame with (4) screws. 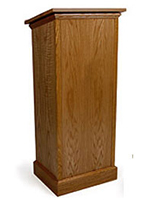 20.0" x 45.0" x 16.3"